Lately I’ve been busy with commissioned artwork on retro surfboards. I’ve always had a love for mural art on boards and vintage in particular lend themselves well to this. 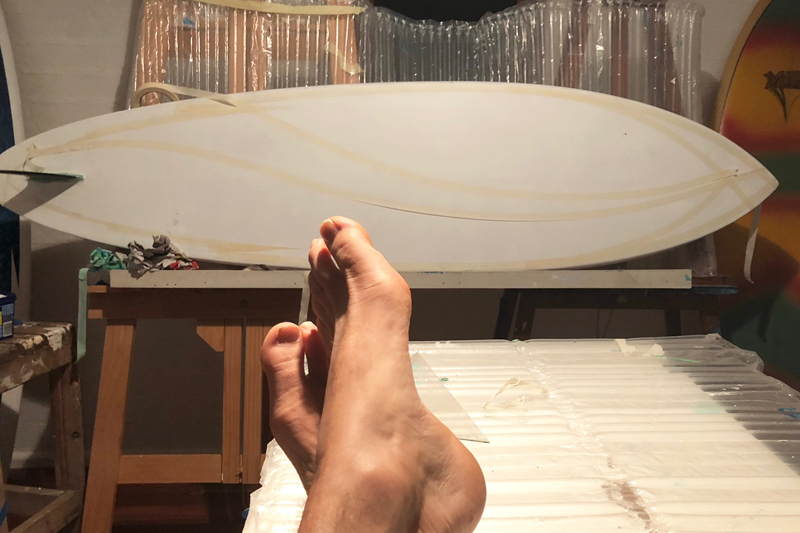 When a mate mine told me he had an old 1970’s single fin that had been under his house for thirty odd years I was stoked at the opportunity to get my hands on it and finally create a piece for my own wall. The board was in dire condition with multiple dings on the bottom, tail almost destroyed an OK deck but over all it was ready for the tip. I took it to Rich from North Coast Surf Traders to fix it as best as he could and she tidied up pretty good. 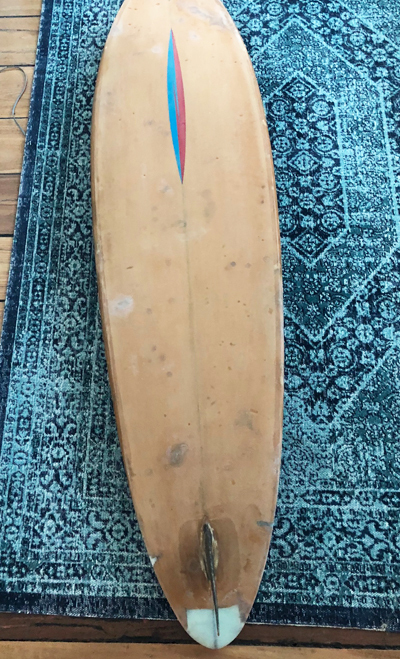 This board shaped by Billy Tolhurst around 77/78 under Ronnie Goddard Summercloud Surfboards is special to me since that’s my era of surfing as a teenager. Funny enough half way into painting Lost in Paradise I ran into Ronnie at Macauley’s Headland in Coffs who confirmed the date of the board. I had in mind a scene that would go with the era and reflect a bit of the retro look of its day, a place I could “mind-surf” that would give harmony to the eye. 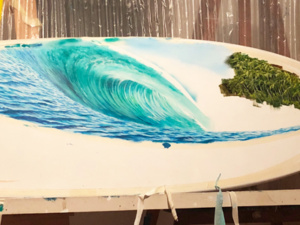 I wanted to paint a wave in acrylics with good movement a paradise background together with an underwater world. The outline lighting bolt borders and pin lining had to flow with the natural curve of the board reminiscent of the Gerry Lopez/ Martin Worthington designs. Back then they used air sprayed paint on the foam, which although looked amazing I always thought lacked detail compared to the fine art of hand brushes. After finishing with 2 coats of clear acrylic for protection I am now very keen to drill in the brackets and mount this piece where it shall retire and be on show in my lounge room!